On May 5th Georgian Triangle Earth Day Celebration and 350.org will be joining Nottawasaga Valley Conservation Authority to plant trees. Many of you may remember the work that 350.org does to bring the world’s communities together to combat the spectre of climate change that confronts our communities, by creating actions that are meant to mitigate the impact of climate destabilization. 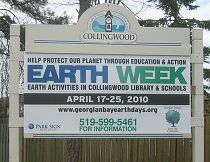 In the past there have been several protests with hundreds of people in the Collingwood area on International Day for Climate Action and over 50 slide presentations at the schools that vividly showed the social justice and ecological impacts of accelerating climate change. Although our area has so far been spared extreme weather such as flooding or drought it is certainly possible for that to happen. (The Great Lakes have lost 71 percent of their ice cover since 1971. The consequences of this loss are great.) Planting trees is always an important part of risk management for drought and flooding as well as capturing greenhouse gases. The May 5th tree planting will take place at Black Ash Creek. We will meet at 9AM in the parking lot of Wal-Mart in Collingwood on Mountain Road. Please bring comfortable clothing, closed-toe shoes/rubber boots, rain gear, bug spray, sunscreen, hat, gloves, shovel (if possible). We’ll be planting white cedar, white spruce and tamarack till noon. If you wish to have information sent directly to you and your family, please write to celebrateearth@yahoo.ca Please sign up your organization and the number of participants who will be showing up on the 5th. Connecting the dots between climate and severe weather has been established. Just this last week Intergovernmental Panel on Climate Change released a long awaited report entitled, “Managing the Risks of Extreme Events and Disasters to Advance climate Change Adaptation”. It speaks about the urgent need to understand the emerging risks brought on by climate change and manifested in extreme weather events that are now accelerating and reduce the vulnerability and exposure of people throughout the world. Another scientific report from the University of Exeter links the tremendous loss of sea ice since 2007 in the Arctic with a tipping point for an ice free Arctic Ocean. Our May 5th tree planting will be one of several Earth Month events in our area to celebrate our green planet. The March 31st climate change awareness campaign, strikingly demonstrated in Earth Hour, was a global success. We will be at our new community garden on October 10, 2010 helping to prepare it for its first full year in 2011. We’ll have some shovels and hoes but please bring extra ones. Also, we’d like to show how push lawn mowers are great for climate stabilization and we hope to have a few of these ready for our community to try out. Our hope is to hire youth for the spring/summer to cut the lawns of people, going from one house to the next by bicycle with the push mowers at the back to transport them. As well, we’ll be signing people up for our clotheslines to be installed in the spring of 2011. Our Georgian Bay walk was a great success. We continue on from here right to Copenhagen and beyond! 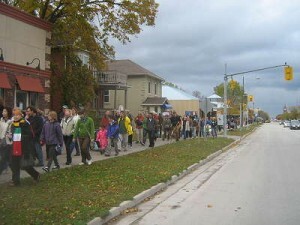 On October 24 at 3:50 PM join Georgian Triangle Earth Days Celebrations, Collingwood Music Festival and the Nagata Shachu Taiko Japanese Drumming Ensemble as we start our walk for Climate Action on Hurontario Street at the Loblaws supermarket and make our way south up Collingwood’s main street. We have a banner that was made by youth. We will be giving out flyers to people urging them to work together to lower greenhouse gas emissions to 350ppm in our atmosphere. For those who wish to get back to the start of the march , where you left your cars or bicycles, a van or the Collingwood biobus will will take you back at 6 PM. RAIN/BAD WEATHER CONTINGENCY DETAILS FOR OCTOBER 24 MARCH: If it is bad weather, please meet at 4:30 pm at New Life Church where our drummers will be ready to greet us. For those who wish to walk rain or shine, the march still starts at 3:50 PM at Loblaws and Hurontario for 4:30 PM arrival at New Life Church. We will be drummed around the large foyer and the gym at that time. The rest of the day will go on as already planned with a 350 photo in the gym instead of being outside. That photo will be part of the 350.org collage of photos shown in Times Square, New York City for the next few days after the Day of Action. 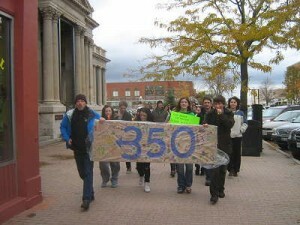 Since youth will be most affected by climate change in the next 30 years, they will play an important part in the walk. Our banner will be held by many people. A photo will be taken of our group at the end of the march; we’ll be in the shape of 350. For those who wish to get back to the start of the march , where you left your cars or bicycles, a van or the Collingwood biobus will will take you back at 6 PM. From 5 PM to 6 PM there will be educational and fun activities for all age groups. David Lawless, a youth delegate from the recent September UN Climate Conference in Geneva, will speak about climate change and ACTION to youth at 5:30 PM. The concert starts at 7:30 PM. We are working with people from Collingwood, Barrie, Orangeville, Thornbury, Meaford and Owen Sound. Please participate and be the change. Humans and other species need to return to a safe planet. 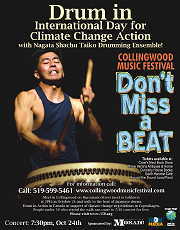 At 7:30 PM the Drumming Ensemble will give a concert and dedicate some music to this important Day for Climate Action. There will be Nature displays in the foyer of New Life Brethren Church (28 Tracey Lane & Hurontario Street), where the concert will be taking place. People under 35 (those who are to be most affected by climate change) who attend the walk in the afternoon can come to the concert for free- free passes will be given out at the end of the march! 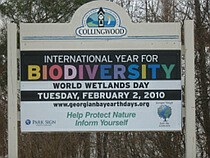 Please see www.collingwoodmusicfestival.com and www.georgianbayearthdays.org for more information. We are encouraged to hear that the other 350.org Collingwood 100 Mile Green Meal is pleased to support the 3:50 PM walk for climate ACTION. In order to have a large turnout, we will be spending the next few weeks before October 24 giving the power point slide show that 350.org has on its website as a launch for further discussion in schools, libraries and other community centres. 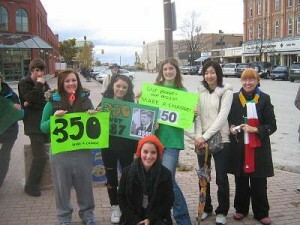 For example, Collingwood Library had a 350 slide presentation on Saturday October 17 at 2PM. 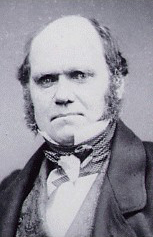 The presentations look at how a target of 350 parts per million of CO2 encompasses many directions for civilization and a return to a stable holocene era. As well, the Library is giving out our 350 flyer as book marks when you take out a book. Please join us and help us make a banner at the Library all week long till October 24!